Thread: PLZ HELP! NUB Overclocker! Processor: AMD Athlon64 3200+ @ 2Ghz, Clawhammer, 200Mhz FSB, 10x Multiplier, L1 cache: 64kb, L2 cache: 1024Kb, 754 socket. 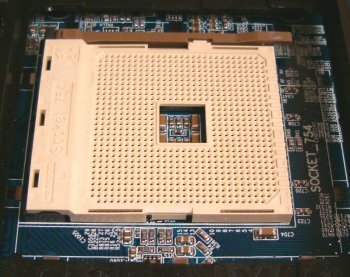 Mobo: MSI K8MM-ILSR (MS-6741). Chipset: VIA K8M800-AMD Hammer. Ram:512Mb DDR-SDRAM 3200 @ 200Mhz, i dont know the ram manufacturer(Kingston,Corsair, etc), is there a program to tell you your RAM manufacturer while in Windows? Video: 128mb GeForce FX 5200. I wanna know if i can OC, should I, and how do I OC if i can(Which programs to use and such). Thanks a lot for your help! Re: PLZ HELP! NUB Overclocker! That chipset doesnt have the required features for overclocking, it is a value chipset with integrated graphics designed for use with Sempron-based systems being sold by OEMs and the like. You can use CPU-Z (do a google search) to identify your ram. If there is any overclocking potential in that board it will be shown in the bois, personaly that is not one ofthe boards I would deal with. That is a very nice processor, I was trying to get one of those for this rig but they were nowhere to be found at the time, so the 512 cache newcastle had to do. If I remember correctly, the K8M800 has the same limits as the K8T800 and the nForce 3 150 for overclocking, which means you shouldn't even bother. Edit: As for Newcastle vs. Clawhammer, I would only want Clawhammer on socket 754 for a system not going to be OCed (with the exception of a 3700-based system), because Newcastle will get to much higher clock speeds, which mean much more performance improvement for AMD K8 CPUs than increasing L2 cache. This is proven by the fact that a 256KB L2 cache Sempron 3100 can outperform a 1MB L2 cache A64 of 100MHz less clock speed. Last edited by Yawgm0th; 02-04-2005 at 11:12 AM. I dont know about the fact that this mobo cant OC, becuase I went into my BIOS and found the place to edit my FSB. I changed it from 200Mhz to 201Mhz (the limit on the FSB is 280Mhz) just to check if it would work, and it did. When I went into Windows and right clicked "My Computer" it read 2.01Ghz so I know that it CAN oc. Why shouldnt I bother Yawgmoth? Becuase I may not get great results? I dont want much, any increase is pretty much fine, I'll be happy with anything from 2.1 to 2.8Ghz, if it'll go that high. Do you know what is good FSB to set it to? Also does anyone know the recommended temp for my processor; its temp is usually siting at around 40-44. SR4470, I already have CPU-Z and it doesnt tell me my ram manufacturer. BTW - I didnt custom build this PC, I bought it from a store. Plz help me out, thanks a bunch! Last edited by Fenix_2; 02-07-2005 at 12:51 AM. CPU-Z sometimes wont tell you, in your case you probably need to look at the sticker on your memory, or heat spreader if it is really nice memory. In other words get some case fans for that beast before you overclock it to any thing above 210HTT, just my opinion, im sure it would be fine up to about 55 or 60C. Thanks for the help AMD_lover (i also love amd) but what is HTT --> (is it the FSB?)210HTT. Also do you or anyone know what is the death temp for my processor? When I say "death temp' I mean the temp at which the processor dies or crashes and burns. My PC is usually at 44C at low load, is that ok or higher/lower than recommended. Also can anyone reccommend me on how to OC now that I know my chipset/motherboard can support OCing. Any recommnedations on which software to use and how to go about OCing. What is the deal with pins and sockets? I dont get it, what are they. Last edited by Fenix_2; 02-07-2005 at 05:13 AM. HTT is the A64 equivilant of FSB, the temp that the CPU shuts it self off is around 65-70 I think though I have never reached it personaly. Those temps are a bit high for a non overclocked system, do you have any case fans at all? You may want lower you temps by getting a friend that has hands on experiance with computers to re-apply your heatsink, and you will probably get a lot better temps, then you wont have to worry about that as much. There are two differnt pinn configurations for A64 based systems socket 754 and socket 939. The diffrence... s939 CPU's have a built in dual channel memory controler as the s754 versions have onle single channel versions. E.g., a s939 A64 3200+ runs at 2.0GHz as a s754 A64 3200 runs at 2.2GHz, both are about the same, but the socket 754 CPU's that are out right now are all that there will ever be, eg no higher than the 3700 willl be made. Last edited by Amd_Lover2004; 02-07-2005 at 12:11 PM. Newcastles OC better than ClawHammers and mine is a Clawhammer so... . However the Clawhammers have 1024kb l2 cache, which i dont think is noticable. I OCed mine to 2.05Ghz and the temp stayed at (low load) 44C (havent tried full load). There are 2 fans in my PC, 1 for the CPU and the other 1 (I think) for the mobo. My cpu temp is usually 44C at low load and my mobo temp is 36 at low load. HD0 (whatever that is) temp is 33C. BTW which programs do you use to OC? Or do u go into the BIOS? Thanks for the info Whats CMOS?? Last edited by Fenix_2; 02-08-2005 at 06:10 AM. I dont know about the fact that this mobo cant OC, becuase I went into my BIOS and found the place to edit my FSB. I changed it from 200Mhz to 201Mhz (the limit on the FSB is 280Mhz) just to check if it would work, and it did. When I went into Windows and right clicked "My Computer" it read 2.01Ghz so I know that it CAN oc. Why shouldnt I bother Yawgmoth? Becuase I may not get great results? The board has no PCI lock so don't expect much of an overclock, but you can get something (maybe 100MHz).